Mental states such as experiences are “presentations” of something outside or inside the body. Moreover, the mind is not like an operating system that monitors what is going on but is nothing but these presentations. Next, a distinction between the conceptual and non-conceptual content of these presentations is made, corresponding to my distinction in Chapter 2 between sentient beings and conscious beings. 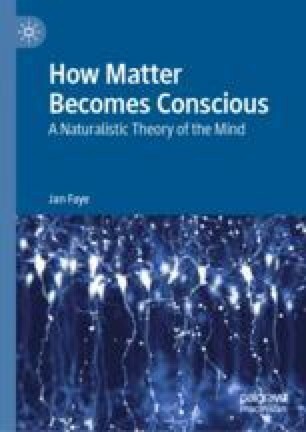 The claim is that sensory impressions in the form of experiencing qualitative properties are extrinsic properties of those brain states and that these extrinsic properties are the way in which the object that caused them is presented to consciousness. The elaboration of this idea discusses in detail how and why sensations provide us with the sensory experience of qualities. Moreover, the same extrinsic analysis applies to the conceptual content corresponding to our experience. In the end, the proposal is that self-awareness or self-consciousness can by understood in the terms of the same tokens.